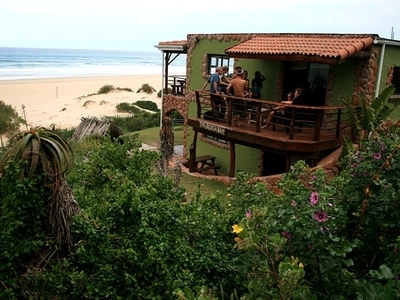 The most incredible location in Jeffreys Bay, Island Vibe is perched on a sand dune overlooking the Indian Ocean. It has a 270 degree view of the ocean and land. Kitchen Windows – an awesome surf break for first timers and pro’s - is a mere trot down the dune; and swimming is a stone’s throw away. Many mornings you will wake to dolphins lolling past or zipping through waves; during July to October the Southern Right Whale comes to play in the bay clearly visible from one of our secluded decks. Jeffreys Bay located in the Eastern Cape is a world renowned Surfing Town in South Africa. The hostel which also is an adventure center/surf school offers surf lessons, sand-boarding ,kayak river safaris, township tours and many more activities. With a restaurant and a bar on site where there are many fun nights including theme parties and beach bon fires. Island Vibe backpackers consists of a hands-on management and ownership team of friendly, young, vibrant, easily approachable and fun individuals with a very good relationship with current staff. Volunteers can expect to be treated very good as is the situation with permanent personnel . I had a magical moment there, walking at the beach and seeing dolphins right in front! It is a party place, beautiful nature and landscape! South Africa is still one of my favorite countries in the world. Tip: use Baz Bus to move around and if you walk to Supertubes (20min) you will see some of the best waves in the world!! !